Discovering the Serenity of the Last Frontier. Camping in Alaska Campgrounds and RV Parks is Alaska's most visited camping guide and an ongoing project devoted to becoming the most exhaustive list of campgrounds in Alaska plus information related to camping and outdoor activities in Alaska. Camping in Alaska by Tent or RV. It really doesn't matter how you experience Alaska, but more importantly, that you do. Read through the guide to camping in Alaska that includes a list of RV Parks and Campgrounds for you to choose from. This is a must read for anyone driving the Alaska Highway for the first time. Although you will never be fully prepared until you actually experience it first hand, this primer will help point you in the right direction and give you that little bit of insight into what you can expect if you decide to undertake the adventure of driving the Alaska Highway in an RV or in your family car. Alaska is a great destination offering endless sightseeing opportunities for those who love nature's unspoiled bounties. From the wide open tundra to the wildlife of Alaska's Arctic wilderness, Alaska has everything a person can ask for and then a whole lot more. Please take a moment to spread the word about the newest and largest Alaska campground directory. We are compiling a list of Cheap Alaska Campgrounds at this time and will report back as the summer progresses. Ever get frustrated with the printed camping guides for Alaska? Well so did we and that's exactly why we set out to publish the Alaska campgrounds survival guide. Chocked full of information found everywhere but yet nowhere, were going to attempt to make camping a bit easier and thus more enjoyable too. We'll be pulling no punches and hide no criticisms, we include the actual information you need to plan the most enjoyable Alaskan vacation imaginable and hopefully save some money at the same time. Get in touch with mother nature by taking the family camping in some of Alaska's best campgrounds. Here is a list of the campgrounds in Alaska that is growing as you read. This all new for 2017 Alaska Camping Guide is going through an exhaustive update to insure the information on campgrounds in Alaska is accurate and correct for the coming camping season. Please contact us if any discrepancies, errors or omissions are noted. An email link is provided on the right hand side navigation of each page or you can contact us anytime on Facebook. Thanks and we hope you enjoy this site. 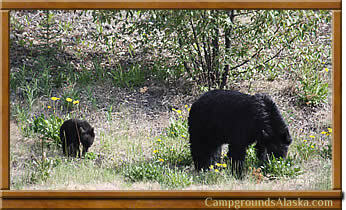 Definitions for Alaska Campgrounds and RV Parks as used in this site. Alaska Campgrounds with Cabins for Rent ic coming soon. Circle of Discovery road tour that takes in the very best of Alaska in an easy to follow journey. 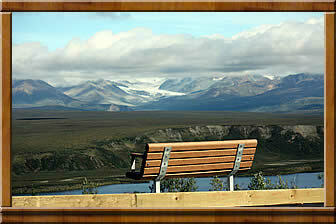 Visit Denali and Fairbanks Alaska than see the sights in the Mat-Su valley, Home to Sarah Palin and her family. Visit Anchorage and Matanuska Glacier. 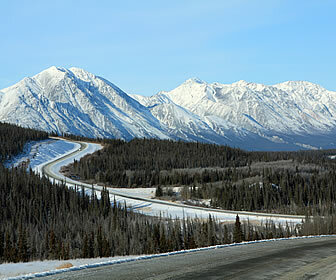 Drive through the famous Thompson Pass on your way to Valdez. Driving to Alaska by RV is discussed in the Alaska RV Itineraries and Route Planner that includes the options for alternative off the beaten path routes and the Alaska ferry too. Alaska Highway Campgrounds & RV Parks: What the camping along the Alcan Highway is like. Over the years we have enjoyed many trips over the Alaska Highway camping in both private campgrounds and in wilderness roadside pullouts too; now including Whitehorse Yukon RV Parks. RV Alaska Ferry looks at the options for navigating the Inside Passage via the Alaska State Ferry. Convert liters to gallons and compare how many liters in a US gallon. Convert Miles to Kilometers with this handy tool. Plus a bonus section on Canadian border crossing assistance with questions for U.S. passport requirements. Alaska RV Sales both New and Used are seeing a big resurgence in interest and sales. Alaska's #1 Camping Guide now includes topics like, driving to Alaska, cruising the inside passage, and renting a RV in Alaska. ALso being added are locations for the latest in Alaska Glamping with information on what's available in luxury camping for Alaskan style glamping vacations with an emphasis on camping in yurts, upscale log cabins, remote safari tents, native dwellings, eco domes etc. The Best Campgrounds in Alaska Camping in Alaska now includes an updated list of Alaska Campgrounds and RV Parks; we've listed the best places to camp in Alaska. Have a favorite campground? Vote for your favorite camping sites by submitting a campground review today! Our free public directory of camping locations and options throughout Alaska. Find campgrounds, camp sites, RV parks both with and without services like electrical and water hookups. Planning your vacation has just gotten a bit easier with our new and growing list of camping and RV parks in Alaska. Look over the list of Campgrounds in Alaska and find the best destinations for your outdoor experience. Just Added a revised List of Soldotna RV Parks, Campgrounds in Soldotna and Anchorage Alaska Campgrounds including Centennial Campground in Anchorage Alaska. Newly Added: Arctic Curly Farm in Trapper Creek AK. Camping along the Alaska Highway will be discussed in some detail although their are many activities happening throughout the northern sections of Canada that can effect the accuracy. These items will also be highlighted to make you aware of their existence so you can plan ahead and avoid any delays of inconveniences. The Alaska Highway Campground Directory is soon to be added in order to help you answer those needed questions before you arrive. The definitive guide to Alaska Campgrounds and RV Parks, Alaska camping, the Alaska Highway and all things related to the Alaskan outdoor lifestyle. Welcome to Alaska's leading outdoor recreation, camping, hiking, fishing, boating, bear viewing and whale watching directory with information on Alaska king salmon fishing, Alaska sockeye salmon fishing, Alaska silver salmon fishing plus all new features for Alaska guided tours, remote fishing lodges, sightseeing tours, and complete Alaskan vacation planning too. Alaska campgrounds and RV Parks is written in conversational language. At times it will seem to move rather quickly while other times it will seemingly drag on forever. Many times this comes from the writers having an intense level of interest on a particular subject, the higher the interest the more content that tends to be written. So a quick read is in no way reminiscent of the quality found at an experience but just on the interests of that writer. NOTE: We're all Alaska residents here at Alaska Campgrounds, each with many years of Camping in Alaska behind us. What you find here has evolved from a long time blog that was very outdated; so time to update all the information have produced this site. From camping gear to outdoor retailers we are adding all of our favorite businesses to the site as we go. We hope it becomes useful and in any small way makes your visit t our great state an enjoyable an memorable one. Have an experience you want to share? Would you like to tell us about a favorite campground or RV park of yours? Send us an email as we want to hear all about your camping and outdoor experiences related to Alaska. If your article or review is approved for publishing you will be notified and all credits will be granted to you as author and published along with the piece. Submit one or many, let everyone everywhere know that You Were Here. Alaska Campgrounds looks at the ever changing environment surrounding outdoor recreation, from new rules and fees for camping and RV's to the changes in how we interact with the outdoors. Our lead writers are devoted campers, experienced outdoorsmen, and backwoods explorers too. Owners Bob and Debbie Jameson are avid RVers spending their summers in Alaska and traveling throughout the south as the sub-arctic temperatures cool. Alaska Campgrounds also features contributions from camping enthusiasts just like you as well as many campground owners and industry professionals too. Coming for 2017 — Our All New Top 25 Things To Do In Alaska: Hitch up the trailer; here are 25 of our favorite destinations in Alaska to check out this summer, all $100.00 or less. For those looking for a way to make a difference while on vacation we are adding areas in need of both short and long term volunteer assistance in Alaska. We have found that through the free giving of our time we have transformed our lives while helping other people, animals, and the environment. It's a great way to make an important difference while enjoying our state of Alaska. Camping along the Alaska Highway is allowed in many pullouts and parking areas provided between locations. Some distances can be pretty extreme so if you do get tired please pull over and get some rest before continuing on up the road to Alaska. There's always lots of questions about the availability of camping on the Alaska Highway, we will be dispelling the myths and passing along some facts as found from 30+ trips over this exciting northern highway. The Alaska Highway Campground Directory is being added to help you answer those needed questions before you arrive. Time-tested practical lessons learned combines with the wisdom earned from 30 years of living and camping in Alaska. Travel Guide to Alaska Camping updates information daily so stop back as this dynamic new website grows into the #1 resource for driving to Alaska by RV. Guide to Alaska Maps, Activities and the Communities you'll pass through when driving North to Alaska through British Columbia and the historic Klondike Gold Rush towns in the magnificent Yukon Territory. 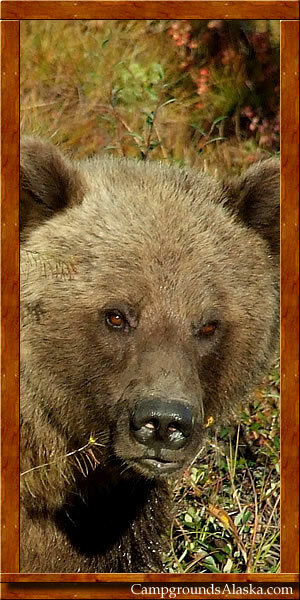 Welcome to Alaska's leading outdoor recreation, camping, hiking, fishing, boating, bear viewing and whale watching directory with information on Alaska king salmon fishing, Alaska sockeye salmon fishing, Alaska silver salmon fishing plus all new features for Alaska guided tours, remote fishing lodges, sightseeing tours, and complete Alaskan vacation planning too.